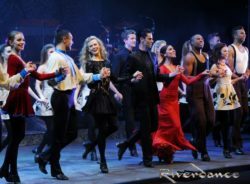 Back by popular demand, Riverdance – The 20th Anniversary World Tour returns to Colorado Springs with a strictly limited engagement at Pikes Peak Center from Tuesday, March 27 through Thursday, March 29. An innovative and exciting blend of dance, music and song, Riverdance draws on Irish traditions. The combined talents of the performers propel Irish dancing and music into the present day, capturing the imagination of audiences across all ages and cultures. Riverdance began its journey as the interval act in the 1994 Eurovision Song Contest, produced for television by Irish entrepreneur Moya Doherty. This electrifying and innovative seven-minute dance piece was then developed into a full-length stage show by Doherty, Composer Bill Whelan and Director John McColgan. For over 20 years, nothing has carried the energy, the sensuality and the spectacle of Riverdance. 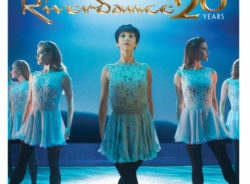 With its fusion of Irish and International music and dance, Riverdance broke all box office records during its world première run in Dublin in early 1995. When it transferred to London, the reaction was unprecedented. 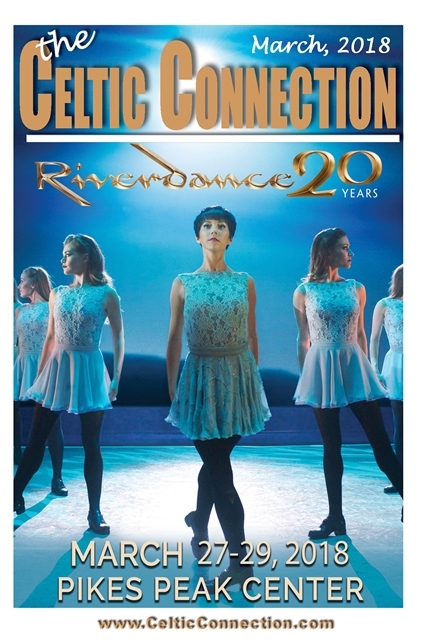 A hugely successful tour then started in New York in March 1996, with eight sold-out shows at Radio City Music Hall, heralding the start of 16 years of non-stop touring by Riverdance companies throughout North America. Since its inception, Riverdance has packed theatres throughout North America, Oceania, Asia, Europe, South Africa and South America. For three days during the last week of March, the world-renowned show will feature new costumes, new lighting, new projections and the addition of a brand new number, “Anna Livia,” showcasing the female members of the Irish dance troupe in an a cappella, hard-shoe number. Tickets for Riverdance at Pikes Peak Center start at $45 and are on sale now at PikesPeakCenter.com, the Pikes Peak Center box office or via phone at (719) 520-SHOW. They can also be purchased at The Broadmoor World Arena box office or at BroadmoorWorldArena.com. After you have had a week to recover from St. Patrick’s Day, why not parade around town visiting the studios of the many printmaking artist in and around Denver. Come participate in the Studio + Print Tour on Saturday, March 24th from 10am-4pm. This is just one of many events that are part of “Mo’Print, Month of Printmaking”. Print makers of all kinds will be hosting open studios giving you an opportunity to see into the printmaking process. Be sure to stop by Moyles Dorney Studio at 1450 Logan Street in Capitol Hill. The studio is run by artist, Brendan Moyles Dorney, who may be familiar to some of you from his time pouring Denver’s best pint at The Irish Rover Pub. 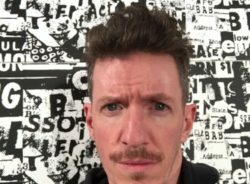 Brendan opened his studio in 2010 and has been screen printing, illustrating, and designing concert posters for national tours and shows at some of Denver’s favorite venues like The Ogden, The Gothic, The Bluebird, and Red Rocks. “Printmaking incorporates so many ways of creating an image, using elements of drawing, photography, and digital design along with color, transparency, and layering- it just feels limitless. I like the process involved in printmaking, especially screen printing. It’s something to constantly learn, improve, and experiment with.”, says the artist. The studio also works with other artist, designers, and businesses creating screen printed goods for a range of projects and promotions. In addition, Moyles Dorney Studio offers monthly printmaking classes for beginners as well as advanced classes for the more ambitious student. “I really enjoying teaching people the process of screen printing. I like that most people can be taught the basics and create their own prints in a relatively short time frame. It’s great to see someone’s face light up when they start to get the hang of it.” Brendan’s work can be found at the studio website www.MoylesDorneyStudio.com and on Instagram with the user name @RabiesBabies_ He hopes to see you at the Mo’Print open studio event. Mo’Print is a celebration of the art of making original prints to inspire, educate and promote awareness through a variety of public events and exhibitions in the Denver metropolitan area, the Front Range region, and throughout Colorado. Mo’Print is supported in part by the Invisible Museum, a Denver-area non-profit dedicated to providing opportunities for visibility within the arts. 2018 marks the 3rd biennial celebration, taking place in March. More details about the non-profit, as well as to view a calendar of events can be found online at www.MoPrint.org. Founded in 1981, The Denver Brass ranks itself as one of Denver’s largest and longest-running nonprofit performing arts organizations. Their concert schedule encompasses a diverse mix of classical, pops, jazz and family programs, along with extensive community outreach efforts. Every March the award winning group “Celtic – Ups” with wonderful Irish/Scottish themed shows for the whole family. On March 10 & 11 (3:00pm) will offer “Echoes of the Emerald Isles” with Celtic Colorado Pipes & Drums and Rick Seaton on Pipe Organ. Experience unparalleled Celtic inspiration in an acoustically magnificent setting. Pipe organ, brass and bagpipes come together to create a riveting and emotional celebration of Colorado’s Celtic heritage. If it’s goosebumps you’re after, this is the concert for you! Brass, Bagpipes & Co.: Off Kilt-er will be the big show at the Newman Center March 16 & 17 – 7:30pm, March 18 – 2:00pm. With Celtic Colorado Pipes & Drums, Wick School of Irish Dance, Rocky Mountain Highland Dancers, Todd Teske – Tenor, Joanna & Iain Hyde – Fiddle & Guitar, It will be a full-blown St. Patrick’s Day extravaganza. If you’re looking for a weekend of non-stop fun, don’t miss this annual sold-out show, you’ll be guaranteed a grand time with great company. Selections from: Firedance, Loch Lomond, Celtic Air on a G String, Ancient Threads, Megalomania Finale and more! Advance tix at $18; Door tix at $20. Denver8.tv at the ‘Local Music’ tab. The online version will be available on Monday March 19th. March 23 -24 Socks in the Frying Pan, Teada, Molly’s Revenge, Pladdogh, Red Hot Ceili Peppers, Julie Hewkin, Round the Bend, Harvest Home, Slip n’ the Jigs, Mark Cantor, lectures, workshops, arts & crafts, food, whiskey tasting, vendors and more! Indoor Festival; info at http://theartsinc.com/celtic-festival/ & tickets at http://theartsinc.com/celtic-festival/ Tickets for full days. Friday only 3-midnight $20; Saturday only 10 am-11 pm $30. All weekend $40. March 14 The Emerald Slippers: An Irish Dance Wizard of Oz 6:30 PM. March 16 The Denver Brass, Bagpipes & Co. In the mid-19th century, pushed by famine, taxes, persecution, and war, half of the population of Ireland ended up on the shores of foreign lands. 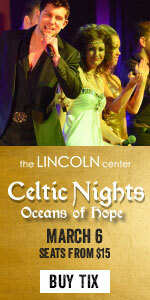 Celtic Nights, the internationally-proclaimed group of Irish singers and dancers, venture to tell that story in Oceans of Hope. Established in 2012, Celtic Nights has traveled the world, sharing songs from their homeland and stories about the places their ancestors voyaged to. What began as a show that delved into the reasons why Irish emigrants made the journey to America, has now become an exploration of Irish history in an all-new production coming to the Fort Collins Lincoln Center March 6. 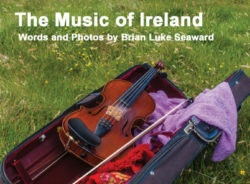 From America to Australia, the melodies and rhythms of Irish music and dance weave a rich tapestry of a people that may have left home behind, but never abandoned it in their hearts. Oceans of Hope will take the audience on an epic journey through moments of joy and sadness, and tell the stories of Irish ancestors. “We wanted Celtic Nights to combine every aspect of the Irish tradition,” states Celtic Nights singer Ciaran Olohan. “We have songs, dance, and story-telling, so we can give a real taste of every aspect in our culture. “Every Irish song has a story,” says Celtic Nights singer, Rebekah Johanne. “If you’re listening to the lyrics, you’re in the story.” In fact, it’s one of the reasons why this show is unique as compared to other Celtic shows. While the show is about exhibiting Irish culture, it’s also about inviting everyone into it.“There are no walls between the performers and the audience,” says Johanne as she describes the wealth of emotions that the show explores, from the serious and reflective, to the comedic and heart-warming. Altan releases new music “Gap of Dreams” March 2, Perform March 3 at Swallow Hill in Denver. After thirty years of playing on stages all over the world from Dublin to New York, Tokyo to Sydney, the premier traditional Irish band, Altan came back to the hills of Donegal to record their new album, THE GAP OF DREAMS. The 13 tracks transport the listener to the lifestyle of rural Donegal, to a time before electricity when folks would gather together in the mists of winter to tell stories, sing songs and dance into the wee hours of the night. The music lifted the locals’ spirits and helped elevate them beyond the hardships of the day like famine, conflict, and emigration. It is this spirit that informed the development of the band through their many phases of growth from a duo performing in pubs to international touring and recording artists. The album title, THE GAP OF DREAMS, is borrowed from a poem by Francis Carlin, The Ballad of Douglas Bridge, in which he writes: “The Gap of Dreams is never shut,” referring to the gap between this world and the Otherworld. The Otherworld has always exerted a large influence on the fiddling tradition of County Donegal and has served as inspiration for song, music, and folklore. Back in ‎Donegal, at Attica Studios in the townland of Termon, it seemed as if the inspiration of the beloved landscape spilled into the studio. 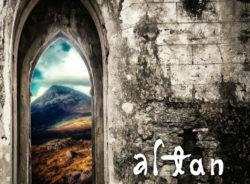 With producers Michael Kenney and Tommy McLaughlin, the new album captures the essence that has continued to represent the hallmark of Altan’s music. THE GAP OF DREAMS will be released on March 2nd, 2018 on Compass Records and Altan will kick off their tour in Calgary, Alberta on February 23rd and will be in concert at Swallow Hill in Denver March 3, 303-777-1003. 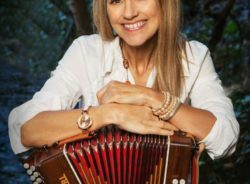 When Sharon Shannon and her band take to the stage March 1st in Denver, folks will be watching an Irish music legend. For some, she might be far too young for that title, but in her particular field of Irish music, she’s a superstar! Last year she celebrated being the youngest ever recipient of the Meteor Lifetime Achievement Award. Known for her virtuosity in playing, endless musical creativity, and her million dollar smile, the button accordion player from Co Clare,Ireland has recorded and toured with a who’s who of the Irish and Global Music Industry, including Bono, Adam Clayton, Sinead O’Connor, Jackson Browne, John Prine ,Steve Earle, The RTE Concert Orchestra, The Chieftains, The Waterboys, Willie Nelson, Nigel Kennedy, Alison Krauss and Shane MacGowan . Sharon has a unique ability to fold, stir, and blend many types music into a delightful sounds like no other. Her 12 studio recorded albums to date have all been very different and groundbreaking mixing traditional Irish with reggae, country, Native American, bluegrass, rap, dance, African,French Canadian. Sharon grew up in a rural community and was part of a family that all play musical instruments and traditional Irish music. However, her career took an massive upward trajectory when in the late 80s she was asked to joined the seminal rock band The Waterboys. Her first show with that band ,to an audience of 50,000 ,was the on main stage at perhaps the most well-known music festival on earth-Glastonbury. Her subsequent debut album was released worldwide and was to become the biggest selling record by a traditional artist in Ireland. In addition to the Meteor Lifetime Achievement Award, Sharon has received many other awards including Ireland’s prestigious Hot Press and Meteor Awards. In 2015 she received an IBAM Award in Chicago for her ‘unique contribution to Irish Music’. Other recipients were Darina Allen and actor Liam Neeson. She co-wrote and produced an album with the High Kings in 2013. When not working on a book on her life, writing material for a new album, or performing or recording with other artists, Sharon, a passionate animal lover, does a lot of voluntary work and fundraising for various animal rescues . In 2017, Sharon released her 10th studio album Sacred Earth. A ground breaking album once again from Sharon. Produced by Justin Adams, this album mixes Irish music with African and blues and features celebrated African Musicians Abass Dodoo and Seikou Keita as well as special guests including Finbar Furey and Alyra Rose. Sharon Shannon, always creative, always brilliant! is located below the Tavern at Lowry, open before, during, and after the concert. The Pine Creek Tippers are downstairs in the lounge at The Margarita at Pine Creek in Colorado Springs on the 16th at 6:30 PM. St. Brigit Episcopal Church, in Frederick, CO at 110 Johnson St., presents a Celtic Cajun Ceili on the 9th from 6-9 PM with live music, jambalaya, cornbread, King Cake, step dancing, storytelling and beer. Celebrating the annual feast of St. Brigid of Ireland and the beginning of Lent (a little early), Pete Strickler and the regulars from Down the Back Lane provide the music, Celtic Steps the dancers and Heather Corey from Verve Movement Studio the calling for the Ceili. $15 suggested donation per adult. Children and youth (18 and younger) attend for free. Proceeds benefit St. Brigit youth group activities. Skean Dubh is at Stella’s Coffee Shop on Olde South Pearl in Denver from 8-10 PM on the 3rd and in the Littleton view house from 7-10 PM on the 10th. 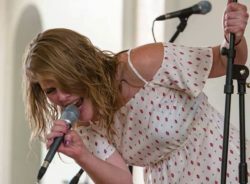 The 2018 Queen Colleen, Jennifer Richards sings at Scruffy Murphy’s in LoDo on the 2nd from 6-7:30. Drink and dinner specials will be running while she performs original and cover songs in benefit for the children in Nepal at the RST Orphanage. No cover, free will donations gladly accepted. Busy month for Wild Mountain that opens with a show on the 2nd at Sheabeen’s Irish Pub in Aurora from 8-12 PM, plays at Local 46 in Wheat Ridge on the 3rd from 9:30-12:30 PM, hits the Nissi’s stage on the 8th from 7:30 – 9:30 PM, heads south to Jack Quinn’s in Colorado Springs on the 10th to play from 8-12 PM, comes home to Clancy’s in Wheat Ridge on the 23rd and plays from 7:30-10:30 PM then closes out the month at Dicken’s Opera House in Longmont on the 24th from 7-10 PM. See http://www.wildmountaingreengrass.com/events/ for ticket prices. You’ll find Big Paddy in the Bohemian Biergarten on Boulder’s Pearl Street Mall at 10 PM on the 2nd. Celtic Thunder’s Emmet Cahill returns to Colorado for two concerts – in Denver at Good Shepherd Catholic Church, 2626 E. 7th Avenue Parkway on the 15th at 7 PM and in Monument at Tri-Lakes United Methodist Church, 20256 Hunting Downs Way on the 16th at 7:30 PM. General admission tickets are $30 with a limited number of Meet & Greet tickets available for $45. Tickets may be purchased online at http://www.emmetcahill.com/tour-dates/ or at the doors. Avourneen plays in Ned Kelly’s Irish Pub in Littleton at 9 PM on the 17th. Lead singer Adam Goldstein takes the stage of the Clocktower Cabaret on the 3rd, 10th and 24th for the late shows. The Firehouse Theater Company presents Gross Indecency: The Three Trials of Oscar Wilde, from the 17th through March 17th at the John Hand Theater/Colorado Free University at 7653 E. 1st Place in Denver. Gross Indecency traces the real-life trials of Oscar Wilde who, in 1895, was charged with “…committing acts of gross indecency with other male persons.” This fascinating play uses real court transcripts and quotes from his three trials to help tell this powerful and poignant story. Performances are Fridays and Saturdays at 7:30 PM and Sundays at 2 PM. Tickets range from $20 to $23 and are available at the box office at (303) 562-3232 or www.FirehouseTheaterCompany.com . Brian Clancy entertains his fans at Jack Quinn’s in downtown Colorado Springs at 7:30 PM on the 1st, 6th, 15th and 22nd. Colcannon is on the Ballroom Stage at the Midwinter Bluegrass Festival in the Northglenn Ramada Plaza on the 17th at 5 PM then does a show with the Cherry Creek Chorale, Celtic! With Colcannon in Bethany Lutheran Church, Hampden and Dahlia, Cherry Hills Village on the 23rd and 24th at 7:30 PM. Tickets $5-$20 online until noon day of show then at the door. Adam Agee and Jon Sousa present an enchanted evening of Irish music to celebrate the release of their second full-length album, Ceol na gCarad – English translation is “Music of Friendship” on the 13th from 7-10 PM at the Nomad Playhouse, 1410 Quince Avenue, Boulder 80304. Tickets $15-$26 https://www.eventbrite.com/e/an-evening-of-irish-music-tickets-41324979125 Tune in to the Seolta Gael show at 7 PM on the 10th to hear a few songs from the album and an interview with Adam and Jon. 88.5 FM and 1390 AM. CaraTrom (aka Tim Baldwin) is at the Arvada Tavern on the 13th from 8-11 PM, Helga’s Restaurant in Aurora on the 19th from 8-10 PM and at the Old Oak Coffeehouse in Niwot on the 20th from 6-8 PM. Wild Mountain plays at “Your Mom’s House” on 13th and Pearl, Capitol Hill on the 17th at 8 PM, Lustre Pearl, 26th and Walnut in RINO on the 19th at 8 PM, and Clancy’s in Wheat Ridge from 7:30 – 10:30 on the 26th. Rumor has it that the band is hard at work on their next CD to be released in time for St. Patrick’s Day. Avourneen provides the music for the Fort Collins Contra on the 6th with lessons at 7 PM and dance at 8 PM in the Fort Collins Masonic Temple, 225 W. Oak St. $10/$5 students and on the 20th at 9 PM in Ned Kelly’s Irish Pub in Littleton, 5886 S. Sycamore St. Free Admission. Adam Goldstein does his solo Irish guitar/singer act at the Clocktower Cabaret on the 13th and 27th. Jan. 13 and Jan. 27. Big Paddy rocks out at the Lazy Dog, 120th and Federal in Westminster on the 26th at 8 PM. The Pine Creek Tippers (successor to The Mountain Road Ceili Band and comprised of Frank Barber on guitar and keyboard, Camilla Bicknell on Fiddle and Beth Harmon on fiddle and concertina) play downstairs at The Margarita at Pine Creek on the 19th at 6:30 PM. Marty Smith has moved to Breckenridge leaving a talent void for several Celtic bands in Colorado Springs. www.newmantix.com/irish and the second show will be in Fort Collins at the Lincoln Center December 20th www.lctix.com/seo-na-nollag . Gather your friends and family sooner than later and share magical holiday memories enjoying a spectacular evening of music and dance. Our wonderful Co-Founder of Irish Dance Theatre, Former dancer with Riverdance, Dancing on Dangerous Ground and principal dancer with Michael Flatley’s Lord of the Dance.Martin was highly successful as a competitive Irish Dancer after starting at the age of five. Under the expert tutelage of Deirdre McAleer ADCRG, Martin attained many titles including All-England and Great Britain Champion. He was runner up at the All-Ireland and was ranked third in the World.During his performance career, Martin’s credits include: Dance AV, Spirit of the Dance, Lord of the Dance, Dancing on Dangerous Ground and Riverdance. His television credits include: Alas!Smith and Jones, Johnathan Ross, The Big Breakfast to name a but a few.Upon moving to Denver, Martin opened a competitive Irish Dance school and taught successfully for 10 years, co-founded a professional Irish Dance company – Strictly Irish and is highly sought after as a choreographer and world class adjudicator for Irish Dance competitions.Together with Máire Clerkin, Martin wrote, choreographed, directed an produced a small ensemble piece entitled: Tom Crean’s Journey: An Irish Dance Expedition that was showcased at the Tom Crean International Festival in Ireland. Martin has hopes to bringthis engaging piece about an Irish hero of the Scott and Shackleton Antarctic expeditions to the States as soon as possible. 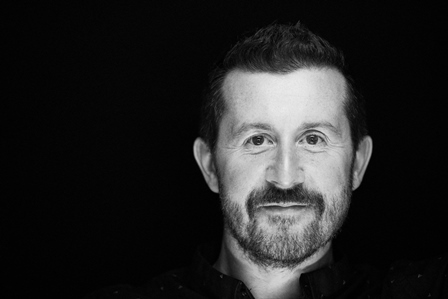 Collaborating with Ciara Sexton to found Irish Dance Theatre has been the most rewarding artistic endeavor to date and he is excited for the mission and future of the company. Marcia grew up in England where she began dancing at the age of 5 under the instruction of Declan Carroll with the Stanley Carroll School of Irish Dance. In 2002 her family moved to Colorado Springs, Colorado where she took classes with ST. Brendan’s, now known as Celtic Steps.Marcia has earned multiple titles throughout her competitive team career, and her solo achievements include a top ten ranking at the World Championships. Professionally, she has had the opportunity to travel and dance in shows such as Strictly Irish and Rhythm in the Night. While currently working towards a degree in nursing, she enjoys sharing her passion for dance by teaching students at Celtic Steps.Marcia is looking forward to being a part of the creative process of the December production from IDT. She thanks her family, friends & dance school for their continued support! A late starter to Irish dance, Robert began his competitive career at the age of nine for the Bennett School in Colorado. The talented Ross family took to dance immediately and for Robert a love of performance was born. The seven siblings of the Ross family moved to the Martin Percival School of Irish Dance where Robbie continued his successful competitive careerAt age 19 Robert embarked on his first tour. For the last six years Robert toured with Rhythms of Ireland as both lead and troupe dancer, intermittently performing with other shows when possible.Robert is looking forward to being a part of a new team, and as a featured dancer will become involved in the creative process, inputting to the shows choreography. Originally from Minas Gerais, Brasil, Mark started his formal ballet training at the age of seven. He graduated from the Baltimore School for the Arts in 2001 and went on to study with the Miami City Ballet School on full scholarship. Upon graduation, Mark joined Edward Villella’s Miami City Ballet and with the company he danced many masterpieces of the late George Balanchine. After departing the company, he went on to join the Alabama Ballet where he danced many soloist roles including Mercutio in “Romeo and Juliet” and Max in “Where the Wild Things Are.” Today, Mark is a photographer in the Denver area. 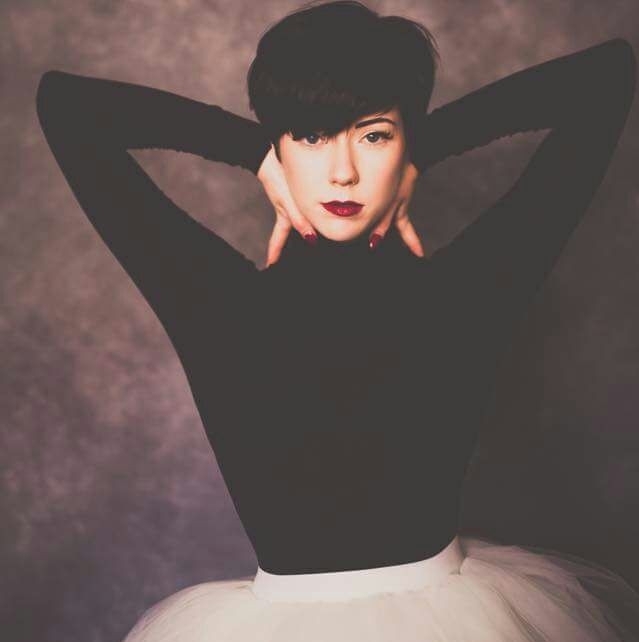 Team IDT are just thrilled to introduce our special guest starring in this years SEÓ NA NOLLAG, Miss Maggie Darlington!Maggie began dancing at the age of three with the Claddagh School of Irish Dance in California, United States under the instruction of Maire O’Connell. She went on to win four North American Championships, two All-Ireland Championships and in 2007 won the World Irish Dancing Championships, and is one of the few Americans to win all three titles in the same year.In 2010 Maggie performed the lead role in Busch Gardens’ production Celtic Fyre. She then went on to originate the lead female role in Battle of the Dance. She joined the cast of Riverdance in 2011, and is currently performing as the principal dancer.When she is not performing, Maggie trains in other styles of movement and dance, and this past year she became certified yoga teacher. Alexia has been dancing for 15 years at the Houston Academy of Irish dance under the instruction of Sally Houston and her 2 daughters Kim and Kerry. She first appeared with Take the Floor in 2012, returning in 2013, and 2014 while also performing with the American Company of Irish dance in 2016. During her competitive career Alexia has won her regional Oireachtas, has placed within the top ten at the North Americans and top 20 at the Worlds Championships. Alexia currently runs her own personal training business helping young aspiring athletes to reach their goals through fitness and proper sports nutrition. She is currently working towards a degree in psychology to become a sports psychologist. Billy grew up dancing in Denver, Colorado at the Reed School of Irish Dance. He competed at the national and world championships multiple times, but his true passion was Irish Dance performance. At age 18 he began living out his dream of dancing and touring the world as he joined the cast of Riverdance. Since then he has toured with many different shows and most recently starred in Rockin’ Road to Dublin. Billy is delighted to be performing with Irish Dance Theater in his home town! World Champion Saoirse Deboy has danced for the Teelin School of Irish Dance in Maryland for 13 years. She has also won 3 North American National Championships, and recently won the 2017 All-Scotland and Great Britain championships. She was the June cover-girl for Irish Dance Magazine and shared her story of hard work and perseverance in moving up the ranks. In addition to competing, Saoirse has been a member of the Teelin Irish Dance Company for 8 years and has performed in shows throughout the mid-Atlantic. Saoirse is also trained in classical ballet and modern dance. She has a passion for Yoga and Pilates and is an ambassador for Celticore, run by Joe Duffey. Saoirse is thrilled to be given this opportunity to perform with Irish Dance Theatre! Elyse started dancing with Cashel Dennehy School of Irish Dance at 5 in Milwaukee, Wisconsin and began her professional career after college with Michael Londra’s show Celtic Fire. Elyse has performed in Ireland, Switzerland, France, Germany, Spain, Italy and the United States with multiple companies including Gaelforce Dance, Women of Ireland, Downtown Disney’s Raglan Road Orlando, The American Company of Irish Dance and has danced multiple tours as the principle, dance captain and choreographer for Rhythm in the Night, The Irish Dance Spectacular.In 2014 she obtained her TCRG and has taught workshops in Wisconsin, Minnesota, Iowa, Colorado, Delaware, Zambia, Italy and through Artists Striving to End Poverty, Elyse implemented and led a dance program in the Dominican Republic for the Mariposa foundation for girls. Currently Elyse based out of Milwaukee where she works full time as a computer sales rep, teaches for the McMenamin Irish Dance Academy, is the founder and director of the The Milwaukee Irish Dance Company and performs with two other local companies: The Showstopper Dancers & Femme Féroce Performance Co. Elyse is very excited to join Irish Dance Theatre’s December cast and to work with such a talented team! 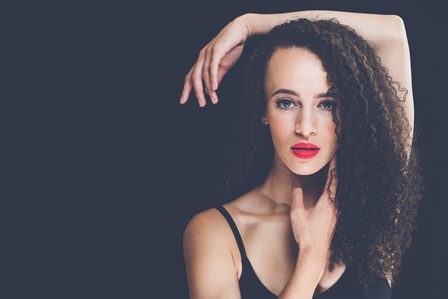 Michaela Fernandes, originally from Goderich, Canada has been dancing for 21 years with experience from a young age in both Ballet and Irish Dance. She currently dances with Glenn Simpson’s Druid Academy in Toronto, and during her competitive career has competed at five consecutive World Championships and placed in the top 5 at the regional Oireachtas. She was recently a cast member with The American Company of Irish Dance in 2016 and has found her true passion in performance. This has developed through many opportunities to perform alongside various professional musicians and dancers. Outside of dance, Michaela holds a Bachelor of Science in Kinesiology degree, and has recently worked in exercise instruction with a goal towards becoming certified in Strength and Conditioning. Currently Michaela loves taking classes in other styles of dance, and continuously challenging herself through different types of fitness training, most recently Pilates. Michaela is looking forward to working with such wonderful talent with Irish Dance Theatre this December! Kevin began dancing at the age of 6 for the O’Shea Chaplin Academy of Irish Dance in Boston, Massachusetts. Throughout 13 years of competitive Irish dance, he has traveled nationally and internationally, and won many titles including the All Ireland Championship in 2014.Pursuing his love for Irish dance, Kevin became his professional career by joining the cast of Lord of the Dance in 2013. Since then, he has performed in numerous shows – most notably in the West end in London and Broadway in New York City with Lord of the Dance: Dangerous Games and a North American tour with Riverdance. Kevin is excited to join the Irish Dance Theater cast in their Christmas production – Seó Na Nollag! I am Olivia Nachtigal, I have danced for 11 years and have been with The Matterin School of Irish dance Edmonton Alberta Canada, under the direction of the Bell family for 8 years. In that time I have earned 4 Oireachtas 1st place titles and am currently ranked 15th at the Worlds. In July of this year I placed first in the under 16 category at the North American National Championship in New Orleans after which I attended the Riverdance summer school in Boston. I along with my sister Londyn are honoured to be on the cover of the November issue of Irish Dance Magazine. I am grateful and extremely excited to be given the opportunity to dance with Irish Dance Theatre and am thrilled to be a part of such a talented team. Cian comes from a big family of talented individuals. His Mother Lisa Kelly and Father Scott Porter were in last year’s production of Seó na Nollag – So, it was only natural for Cian to jump at the opportunity to audition and guess what… His video didn’t just impress. It blew us away! Welcome Cian. We wish you every success.Cian Porter hails from Dublin, Ireland, but is now a resident of Peachtree City, Georgia, USA. 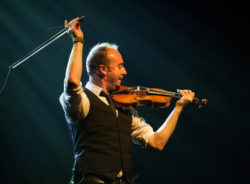 In his younger years he grew up on tour with both Riverdance The Show and Celtic Woman productions with his parents, Lisa Kelly and Scott Porter.Cian spent most of his time playing football, but in 2013 he tried his first Irish dance class to initially strengthen his legs. He was hooked! Very quickly Irish dancing became the biggest part of his life. In 2014 his father, Scott Porter TCRG, opened the ‘Kelly Porter Irish Dance Academy’ and affiliated with the renowned ‘Drake School of Irish Dance’.In 2015 Cian went on to win the Southern Region Oireachtas and qualified for the World Championships in Glasgow. Since then he’s competed in multiple Major Championships achieving 2 Regional Titles, Top 15 at the Worlds, Top 10 in the North American Championships, and Top 3 at the All Scotland’s.Having spent all his life in the Entertainment Industry, Cian has also performed in many professional shows including- Lisa Kelly The Voice of Ireland, The High King’s Live, The Chieftans, Chloé Agnew Live in Concert, Emmet Cahil Live in Concert, and Paul Byrom Live in Concert productions, to name a few.Cian is honored and very excited to be a cast member of Seó na Nollag: A Celtic Christmas Celebration with ‘The Irish Dance Theater Company’ and work alongside so many phenomenal performers, choreographers, directors, and producers. Kieran is from Newark, New Jersey and dances for the Heritage Irish Dance Company. He was formally trained in Irish dance by the late Peter Smith.He has competed nationally and internationally for many years, achieving 5th at the North American Championships, 8th at the Worlds, and 2nd at the Mid-Atlantic Oireachtas.At 16 he performed in “Thats Dancing!” by studio2stage and at 17 he joined The Raglan Road Irish Dancers.Kierans main passion in life is Irish dance and he thrives whilst performing for an audience! 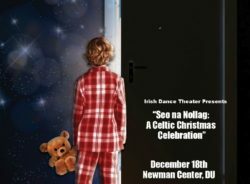 The Irish Dance Theatre, a joint venture of Martin Percival and Ciara Sexton, presents two performances of “Seó na Nollag: A Celtic Christmas Celebration” on the 18th at 7:30 PM in the Newman Center, University of Denver; tix are $20-52.50 at www.newwmantix.com and on the 20th at 7:30 PM at the Lincoln Center in Ft. Collins; tix at www.lctix.com. A donation will be made to Firefly Autism For each ticket sold. Kindred Spirits presents their 7th annual Winter Spirit concert with special guests Eric Olson and James Messerich on the 2nd at 7 PM in the Tuft Theater at the Swallow Hill Music Hall in Denver – tix $15, $2 less for members and on the 9th at 7:30 PM in the St. Frances Cabrini Music Room Theater in Littleton – tix $10. Info at www.thekindredspirits.com. The 32nd Annual Winter Solabration, a community celebration of music and dance, happens on the 23rd from 6 PM – midnight in the Joyful Ballroom, 3695 W. 72nd Ave., Westminster. The night features a Mummer’s Play, Maroon Bells Morris Dancers, the High Country Dancers, Bryan Connolly Extreme Juggling, Storyteller Susan Marie Frontczak, Solstice Sword Dancers, Breathless in Berthoud, Abbot’s Bromley Horn Dance and traditional American community dancing. Tix $25 in advance at www.wsolstice.org, $32 at the door, teens $19, children 6-12 $9. The Ancient Order of Hibernians, Father Joseph P. Carrigan Division present their 7th Annual Family Irish New Year’s Celebration on the 31st at The Celtic on Market, 1400 Market Street, Denver. The family celebration is open to the public, with a $10 cover charge for entry and party favors. The event includes traditional Irish music from session players, entertainment from Juice O’ the Barley and The Celtic Friends, bagpipes from the Michael Collins Pipe Band and Irish step dancing. 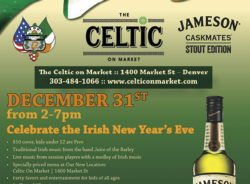 There will be a specially priced menu from The Celtic on Market kitchen, party favors and entertainment for kids of all ages with a countdown to New Year’s leading to a Jameson Irish Whiskey toast at 5 PM with a Bagpipe New Year’s salute and singing of Auld Lang Syne. Proceeds from the event will benefit the Catholic Samaritan House, Purple Heart homes, Annunciation Catholic School and other Carrigan AOH-backed charities and projects. Brian Clancy takes the stage at Jack Quinn’s Alehouse and Pub in downtown Colorado Springs at 7:30 PM on the 7th, 14th, 21st and 28th. Take Down the Door performs at the Chief Theater in Steamboat Springs, 813 Lincoln Ave, on the 15th and 16th from 7-9 PM. Chancers Hooley inaugurates Scruffy Murphy’s new live music happy hour in The Ballpark Neighborhood of LoDo on the 1st from 5:30 to 8:30. Eric Crawford does the Scruffy’s happy hour on the 8th from 5:30-8:30 PM. Star Edwards offers her lovely harp playing on the 22nd at the Cherry Creek Library, 305 Milwaukee St. in Denver from 11:30 AM to 12:30 PM, the Smiley Library, 4501 W. 46th Ave. on the 23rd from 1 to 3 PM and at the Unity on the Avenue Church, 4670 E. 17th Ave. Parkway in Denver at 5:30 on the 24th. Wild Mountain kicks off the Bridging the Music Awards program on the 6th at 7 PM in The Oriental Theater in west Denver and entertains the patrons at Clancy’s Irish Pub in Wheat Ridge on the 15th from 7:30-10:30 PM. Keith Harkin, one of the lead soloists for Celtic Thunder appears on the Soiled Dove Underground stage at 8 PM on the 16th. Tix $35-$55 at www.ticketfly.com . Avourneen provides the music for the Denver Contra Dancers on the 8th at 8 PM in the Highlands Masonic Center, 3550 Federal Blvd., Denver. Tickets start at $8. On the 9th, they liven up Ned Kelly’s Irish Pub, 5686 S Sycamore St. in Littleton at 9 PM. Free admission. Adam Goldstein does his solo Irish song and guitar act at the Clocktower Cabaret for the late-night shows on the 2nd, 16th, 23rd and 30th. Big Paddy does a Holiday Show on the 8th at 10 PM in the Bohemian Biergarten on the Pearl Street Mall in Boulder. The McDeviants are on the Jack Quinn stage in Colorado Springs on the 2nd from 8:30 PM to 12:30 AM and have the early show on New Year’s Eve at Jack Quinn’s from 4 to 7 PM. Tim Baldwin aka CaraTrom performs his Irish/bluegrass/fusion at The Laughing Goat in Boulder on the 7th from 8 to 9 PM. 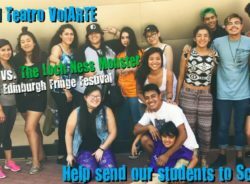 Denver’s award winning Teatro VolARTE student theater group have been selected to attend the prestigious 2018 American High School Theatre Festival (AHSTF)in Edinburgh, Scotland next August. This event is part of the larger Edinburgh Festival Fringe which showcases companies and actors from all across the globe. During the AHSTF program students will spend two days sightseeing in London then travel to Edinburgh, Scotland where their 10-day Fringe adventure begins. This is a once in a lifetime opportunity for our Denver students but it comes at a price of $7,500 per student. Challenged by an overall goal of $100,000 the students continue to work fundraisers and accept donations. Any assistance will be greatly appreciated – Call 303-296-0219 if you can help. Teatro VolARTE is part of the programing offered at Su Teatro Cultural & Performing Arts Center At 721 Santa Fe Dr Denver, Colorado. Su Teatro was founded in 1972 and has a mission to promote, produce, develop and preserve the cultural arts, heritage, and traditions of the Chicano/Latino community; to advance mutual respect for other cultures; and to establish avenues where all cultures may come together. Considered to be one of the best student theater groups in the country, Su Teatro annually produces 4 to 5 plays and has earned group an individual awards. Su Teatro has created more than 15 original full length productions and has performed in New York, Los Angeles and other venues around the country.